Experimenting with materials relating to willow. ‘What I found interesting was the similar themes he touched on as Andy Goldsworthy- ‘touching the stuff of the place’, ‘getting the flow going’, ‘working rhythm’. He talked to students about ‘having experiences’ and ‘recognising what is with in you’. He spoke of how often artists are anxious about the’ finish’ of a piece, but suggested that it was in fact dependant on the start, and the routine, and keeping the flow of the work going. He spoke of energy and work ethic and said that for spontaneity to come into work requires rigorous preparation. All these thing were hitting a cord with me and making me think I should take note of this. The other thing that interested me was what he said about how as an artist we are all trying to find our individual language, but pointed out that we are social beings and need to connect with other so should also be considering how our work fits into the wider community. He made a comment about ‘tenderness’ and how he felt it was absent from a lot of work now’. A piece of willow is a line and its natural inclination is to make a circle. These are elements I can see in my work. Along with the physical nature of working with the willow, it is has a repetitive nature with a sense of rhythm, it is intuitive and very much led by the material itself and the outcome is always uncertain. I have very much tried to focus on the doing, responding intuitively and spontaneously to my creative activity. I have worked with willow, both living and basket makers willow, I have made studies and drawings of various aspects /details of the willow work, I have also used photography to record the willow, but have also photographed drawings that I have then manipulated using photoshop. 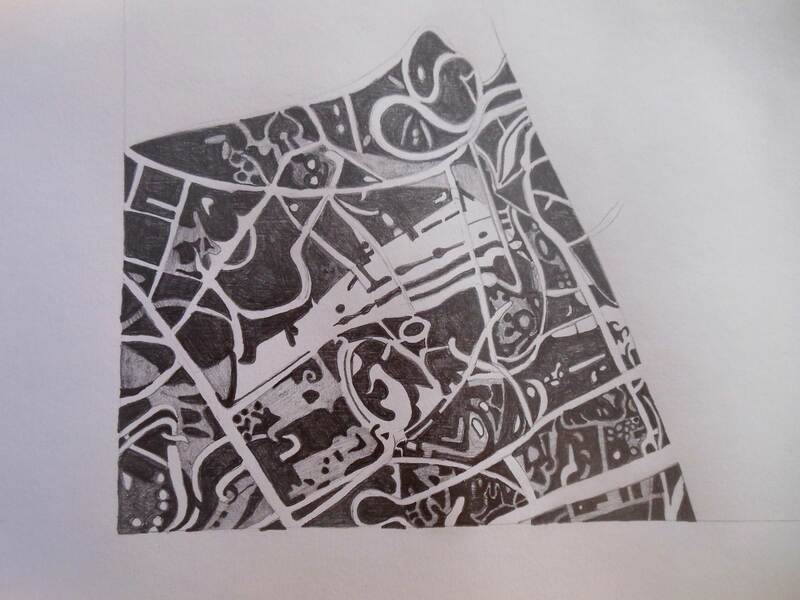 I have tried purposely not to be too analytical about the work at this very emotional time but have made observations around the use of positive/negative spaces, repetition, shapes, combining geometric shapes with organic ones, working expressively v’s more contained drawings, working on both side of the paper. Working to extend small drawings. Made on A1 cartridge paper using Somerset charcoal. 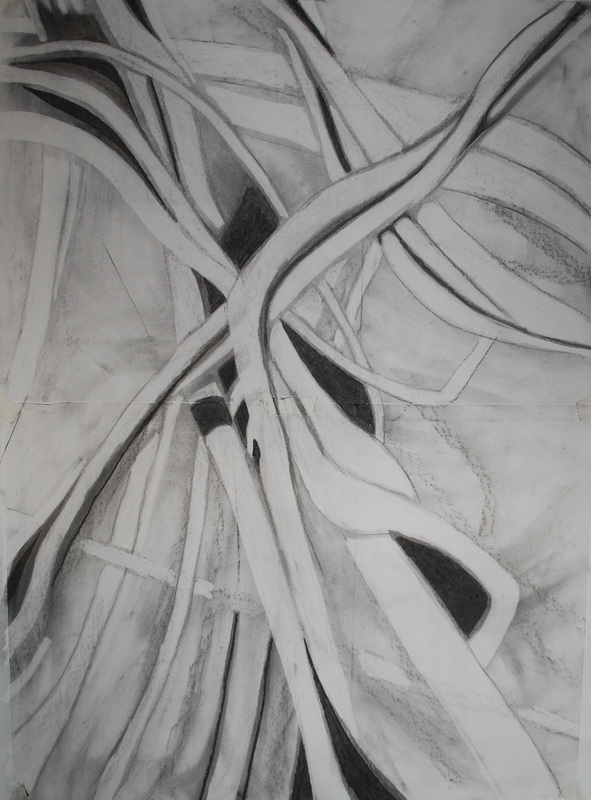 Revisiting Root Drawing. Made on A2 cartridge paper (detail) using graphite. Made on A0 (2 sheets of A1 joined) cartridge paper in charcoal. 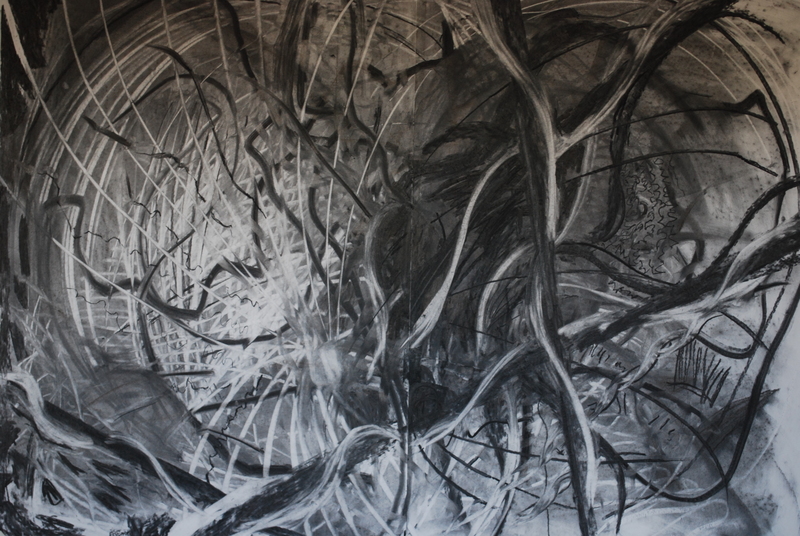 Large Willow Drawing 2. Made on A0 ( 2 sheets of A1 joined) cartridge paper in Somerset charcoal. During this time I have very much focused on the practical work, but I have considered other artists response to loss- Picasso’s Blue period and the work of Munch. I have, however, been more drawn to the work of Andy Goldsworthy and David Nash. Goldsworthy’s words ‘Learning and understanding through touch and making is a simple but deeply important reason for doing my work’, have a resonance for me. I have found that very often it has been the activity of my hands that have enabled my thoughts to go to a place that has been less emotionally distressing, whether it be drawing, making, or scrubbing walls. It brings to mind David Hockney’s reference to ‘the hand, the eye, the heart’ as qualities of an artists, but I find it quite interesting to think about the neurology going on here. Working with the willow is a very spontaneous, intuitive activity and there is something about the physical act of making which is unconscious. 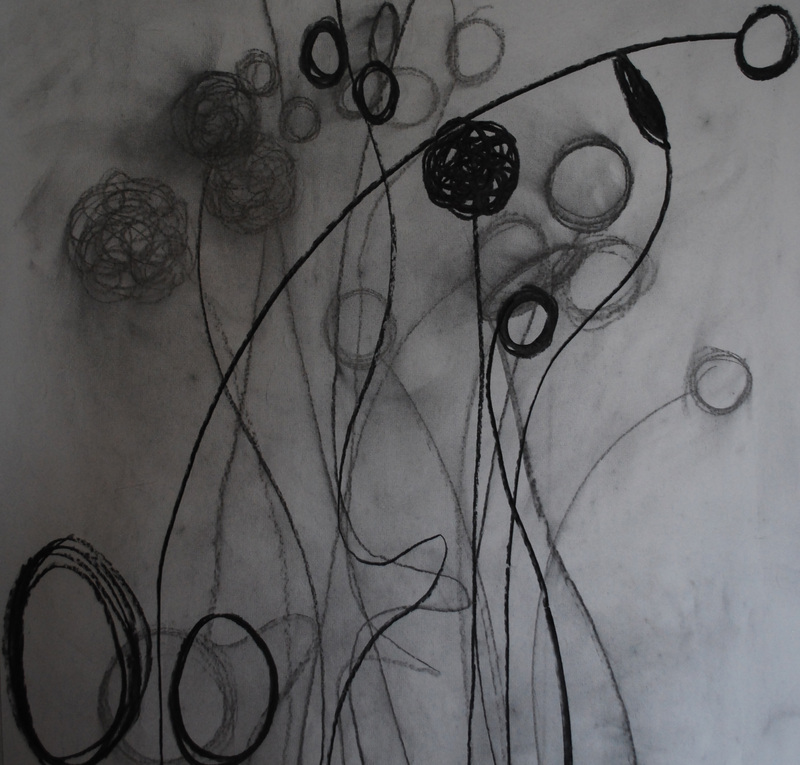 The drawing then becomes an observation of what has happened, in a sense trying to understand it. I have found it quite difficult to think about how my work might fit with other artists, but my thoughts have turned to Graham Sutherland’s abstact works from the close observation of nature and also, for the meditative nature and repetitive actions in the work, the action paintings of the abstract expressionists. Thoughts around my critical review are unclear at the moment. I was going to consider aspects of the landscape relating to the Somerset Levels, but my horizons have very much retreated. The notion of ‘inner landscapes’ come to mind now, but I think I need a bit more time to see where I’m going with my practical work. It may be more appropriate to focus on one artist- I am aware that Anselm Keifer is showing at the Royal Academy later this year, a possibility. I have also enjoyed the work of Ellen Gallagher and will be going to see some of her new work this week end in London. Final Reflections on completing Painting 3- Major Project and Contextual Studies. Reflections on tutor report for Conceptual Studies assignment 5. So close to the end!!! How to present making a Trace drawing as a performance piece.